The weather had cooled down a bit by the time that we finished eating, so I decided to throw on a warm sweater with white jeans. 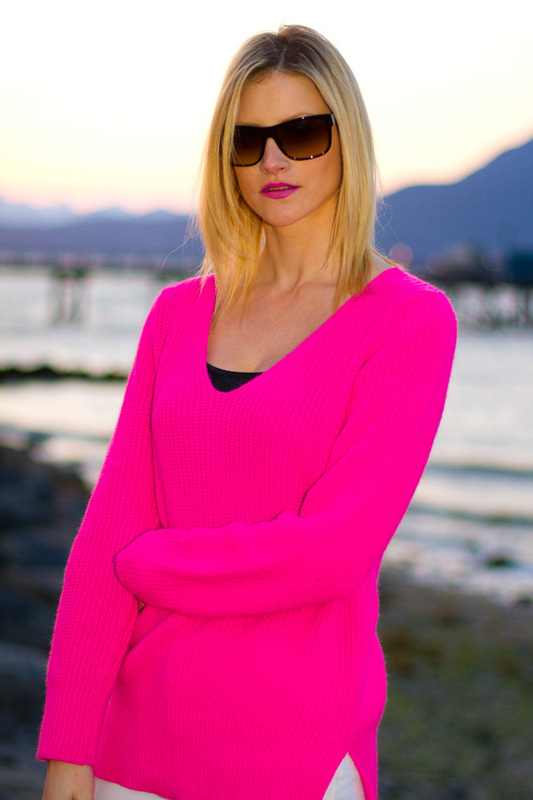 I feel like this sweater is perfect for a cool spring night because it's so bright and fun! And the great thing is that it hides my tummy that is so full of curry :) I thought the sweater was enough, so I didn't wear any jewellery at all today -- very unusual for me! I hope you have a great evening and thank you so much for all your lovely comments! They really make my day! Love this pink sweater with the white pants! So cute! I love this colour!!! great pics and look!! nice top lurving it, you got great style. if u dont mind lets follow each other. Very simple and chic! This reminds me that one does not need a ton of accessories to look pulled together. Such a gorgeous colour of top, especially against the white jeans! you really look amazing,thanks for your comment dear! Perfect outfit to go wherever! Amazing colour!! I hope you'll visit my blog! amazong outfit! Love the colour!! i have never tried to make curry at home! is it hard or did you use a pre prepared curry sauce? also there is nothing better than a nice after dinner walk the pictures are beautiful! Great look! I love the first picture, so beautiful! Hey, love your style, I own the same sweater and I love it! Following you, of course! That sweater is amazing! Love the color! Ton pull est tres belle!! !J'aime la couleur!!! Wow, you look amazing! Love that you paired the neon with both black and white! Hey Alison, thanks for passing by and your comm! Very nice blog. Love this pink sweater! You are doing very good! Looking forward to read more! Awesome sweater! You look amazing! Thanks for the comment on my blog and yes the pants on my last post are like jumpsuit! I am in love with your hot pink sweater. You look absolutely gorgeous. Thank you so much for visiting and your comment! You have a nice blog here, the pictures are great! I follow you now, pass by at my blog again anytime you like :-)! I love all of your floral and neon selections! its looks really good on u! This is so stunning Alison! I am absolutely loving that neon pink on you, suits your colouring perfectly, and paired with white denim it's the perfect summer look! Love the colors and the photos!!! Love me some neon pink. That colour looks great on you, I have one similar but oversized. Beautiful outfit,like the color very much. That colour is incredible! Great location to shoot this sweater too. The brightness of the sweater is accentuated by the white jeans. Nice combination. I LOVE this outfit! 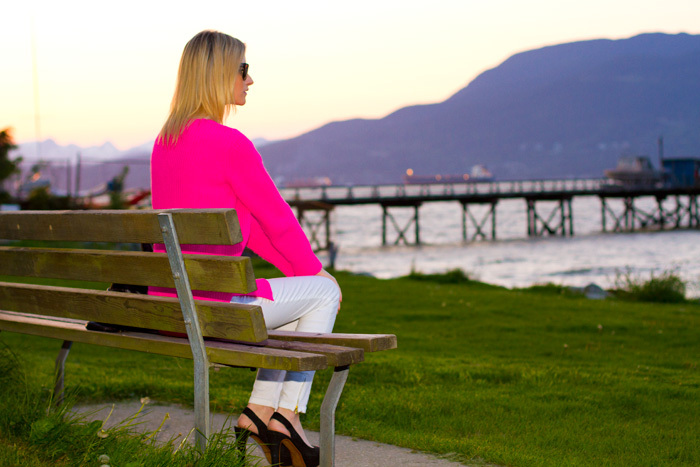 I am obsessed with pink & white pairings lately, and this one is so well done - in love with how bright this sweater is! Gorgeous!